Chillum Pipes - Glass Pipes -The Greatest Online Smoke Shop! If you’re looking for a straightforward, no-nonsense smoking experience, a chillum pipe is the way to go. The simple design makes them perfect for an on-the-go smoke. A chillum pipe is traditionally a straight-shot to the mouthpiece, and the size of the bowl varies depending on the specific design. These pipes were originally designed and used for ceremonies, and are still used to be passed around in a group rather than an individual smoking alone. Chillums are simple, they don’t compromise flavor, and they’re very inexpensive. Just because the construction is simple, doesn’t mean that chillum pipes aren’t their own works of art. We carry a wide range of chillum pipes in some of the most unique and beautiful designs available today. On top of solid designs, we also carry chillum pipes that change color when you use them. A chillum pipe is the perfect social pipe and will allow you to truly express your personality through a unique design. Adding a quality chillum piece to your collection doesn’t have to be expensive. 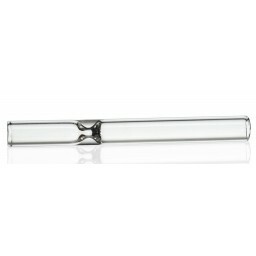 We have chillum pipes for beginners to experienced smokers, so you can be sure that we have just what you’re looking for. Check out some of our top selling chillum pipes to add to your collection today. 3" Fumed Glass Chillum Clear Glass - Buy One Get One Free.